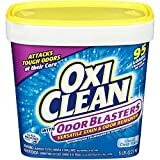 OxiClean Odor Blasters Versatile Stain Remover contains the same incredible oxygen based stain removal power of OxiClean Versatile Stain Remover that’s chlorine free and color safe. PLUS it’s specially formulated to attack tough odors like musty towels, body odor and sweat. OxiClean Odor Blasters uses the power of oxygen to get tough stains and odors out of your laundry and throughout your home. Use in every load, or pre-treat and let it soak in! Soak 1-6 hours, and for best results soak 6 hours – even the toughest stains and odors get washed away!